I ran the Run for the Horses 5K on Saturday September 1, in Saratoga Springs, NY. For a refresher, the night before the race, my flight got delayed several hours, and I finally got to Albany at 3am and into bed at 3:30am. Not good when I had to be up at 6:30am for the race! My Fitbit vibrating alarm woke me up with a jolt on Saturday morning, and I knew I was definitely not rested. For a few seconds I considered going back to bed, but since I was already up, I realized I might as well race. Maybe I could get a nap in later in the day? I started getting ready, and when my mom came in to chat with me, I realized my voice was a little bit hoarse. Oh yeah… this was not going to be a good race! I was a little slow in getting ready, but at 7:15am, my dad met me and we were off. I definitely needed a coffee stop along the way though! 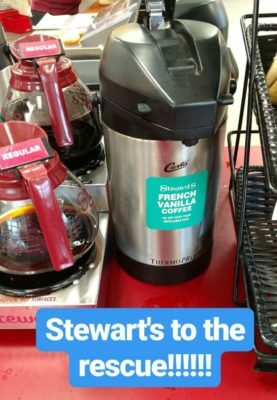 We stopped at my beloved Stewart’s and I got a full 24 oz caffeinated coffee. I never drink this much caffeine, but I figured if there was ever a day for it, this was it! We got to the start a little after 8am, so I didn’t get to see the kids run that started at 8. Instead, I hit the porta potties, grabbed my packet, and tried to get myself into race mode. I looked up my race report from two years ago on my blog, which gave me a better idea of the course profile and what my splits should look like. 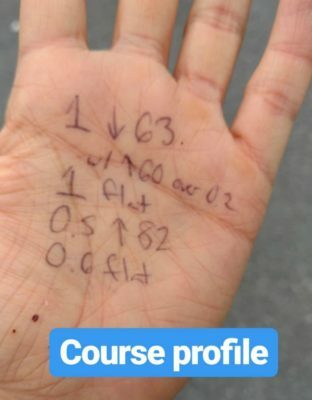 Since I didn’t trust my sleep-deprived brain, I wrote the profile out on my hand. I knew I’d get progressively slower as the race went on, both because that’s my natural tendency and because of the hills. The first half mile was downhill, then 1.5 miles mostly flat, a half mile of uphill, and a half mile sprint to the finish. Since I tend to surprise myself with how I do, I figured out in my head what would get me to a sub-20 finish, even though realistically I knew there was no way I would do that. But always better to have a plan just in case it’s a strong day! I didn’t end up looking at this once, but having it written down was reassuring, since I didn’t know if my sleep-deprived brain would be able to remember it. I positioned myself toward the front of the pack at the starting line. Even though it was chip-timed, I learned my lesson from the week before that if you think you might place, you better start up at the front! I was about three people back from the line, and in front of me was a small boy who looks like he was six or seven years old. The race announcer made an announcement that runners should try to seed themselves so that the people in the front where the fastest, and everyone looked at the little boy, but he just grinned and held his ground. Maybe he would be faster than we thought? Nope. The gun went off and all the runners took off, with everyone parting ways to go around the little boy. Oops! I was just glad I didn’t trip over him myself, since he was about half my height. A bunch of the men had taken off really fast, but only one woman seemed to be in front of me: a high school-aged girl in a sports bra and shorts, who seemed ready to race hard. We turned out of the parking lot and onto the road, and the downhill began. Woohoo! I was definitely sluggish from my lack of sleep, and I was also noticing the significant heat and humidity, but it still felt great to speed down the hill, passing a bunch of guys as I did so. Another woman about my age passed me on the hill, and then we both passed the high school girl. Okay, so I was in second place… could I hold it? The hill gave way to the flat section I had expected, and then we turned the corner for the short-but-steep hill in the middle of the flat. I charged up the uphill, reminding myself that there would be a nice flat section at the top. It didn’t feel too bad, even though it was about 50 feet of gain in just two-tenths of a mile. At the top was the one mile marker, as promised, and I clocked in at at 6:12. That was faster than I thought, given how tired I was, but also slower than I would have liked if it were an ideal day (given how much downhill there was in that first mile – a net 45 foot loss). Still, it was about 30 seconds faster than I had run the first mile two years ago, so I was pretty content. As I approached the turnaround, I saw that the lead woman was about 20 seconds ahead of me, and I knew I wouldn’t be catching her. But after I took the hairpin turn and started going back, I saw that the third woman (the high school aged girl) was about 30 seconds behind me – so presumably I was safe. Still, I had no intention of letting up my pace. I was significantly ahead of where I was last year, and I wanted to see how much of that lead I could keep. The second half of mile 2 wasn’t bad, because it was that slightly-downhill-but-mostly flat – followed by the big steep downhill right after I crossed the two mile mark. I clocked the second mile in 6:45 – 33 seconds slower than my second mile, but still 31 seconds faster than I had run this mile two years ago. I was doing great, despite the conditions! I remembered last year listening to a song about the sun coming out right as the sun came out from the clouds in real life, but today, it was staying pretty hazy and hot and humid – not nearly as nice weather. The steep downhill was quick, and then I was faced with the half mile steady uphill. I was really tired, and my pace dropped into the 7:15-7:30ish range for this section, but I knew I was on track to not only crush my time from two years ago but also even possibly PR. This was not the time to give up! I focused on the guy a few dozen yards in front of me, and tried to gain on him rather than letting him pull away from me. I reminded myself that there was only about five minutes left until I’d be able to see the finish line, and tried to focus as much as I could. And then I got myself really into gear, and put on my power song of the summer, “This is Me” from The Greatest Showman On Earth, which has been inspiring me since Experience Camp. Finally, I reached the top of the hill and the road flattened out. In Orangetheory, after an all-out, we usually get a walk break, and so I kind of wanted a walk break here… but absolutely not. I reminded myself that the hill was over, but that didn’t mean time to catch my breath; I needed to keep that intensity and use it to get faster now that I was on flat ground. I focused on the strong downbeats and inspiring words of “This Is Me”, and reminded myself that there were now less than three minutes left in the race… go go go! I crossed the three mile mark (7:02 pace for that last mile, or 34 seconds faster than two years ago) and started immediately picking up the pace as fast as I could. I passed the girls directing people at the final turn without the wave I usually give to volunteers, instead just focused on squeezing out every last bit of speed. As I flew down the final stretch, I saw the clock ticking closer to 21:00 and I was determined to stay under it. I crossed the line in 20:57 – three seconds shy of my PR! I had somehow managed to run my fastest time ever on a muggy day, a reasonably hilly course, and with only three hours of sleep! The time on the finish clock is exactly what my finish time was last year… but this year, that time reflects about two minutes of me catching my breath, getting water, and then heading back to the finish for a leisurely pic. I’ve come a long way! I was definitely breathing hard after I finished, especially with that final sprint to get across the finish line before the clock hit 21:00, but once I caught my breath – I was so proud! I had gone into the race expecting to do very poorly, between my lack of sleep, the heat and humidity, and the somewhat hilly course profile. 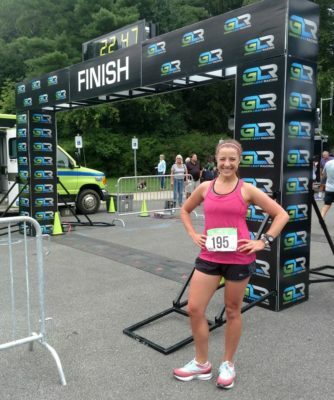 When I had run this race two years ago, I finished 1:43 slower – or 33 seconds per mile slower than this year. That’s a lot! 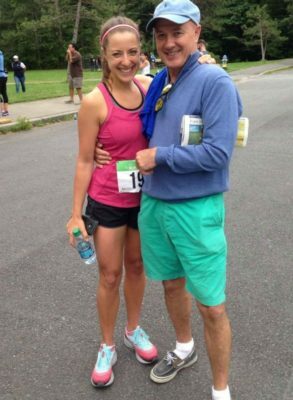 And furthermore, when I ran this race in 2014, I went on to PR at the flat-and-fast Drawchange 5K in 21:00, taking off 1:37 from my time. I have to think that means that if I were to go back and do the Drawchange this year (or another similarly fast race at sea level), I’d be able to shave off a similar amount… which would put me well under my ultimate goal of running sub-20. Unfortunately, with the election season heating up, I highly doubt I’ll be able to get a sea level 5K in this fall, but it still makes me proud to know that sub-20 is almost definitely within my reach if I were to get the right conditions. I had to wait quite a while for the awards, which didn’t start until an hour after the 5K had begun. But, I got to enjoy hanging out with some of the retired racehorses (who are the beneficiary for this race) while I waited. 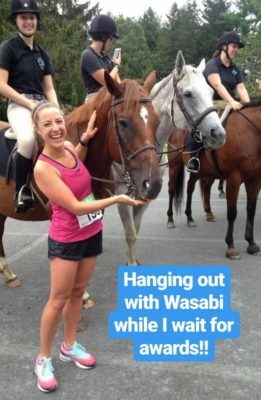 One of the trainers gave me a handful of oats to give Wasabi, and I absolutely loved letting him eat out of my hand! When it came time for the awards, my Dad cracked me up. Each of the age group winners (top three in each group) got a medal. However, the overall winners instead got a baseball cap and a koozie. I have more medals than I know what to do with (let’s be clear, most are participation medals), so I was psyched about the cute baseball cap, but my Dad was hilariously riled up that as an overall winner I didn’t get a medal as well :) Too funny! Finally, I’ll close my race report by noting that post-race, my Dad wanted to stop at Stewart’s for gas and coffee before we headed to my brothers. Since I was still all hopped up on the caffeine from earlier, I skipped the coffee, but I still went in with my Dad… and was eyeing the flavors at the ice cream counter. It was only 9am; should I do it?? 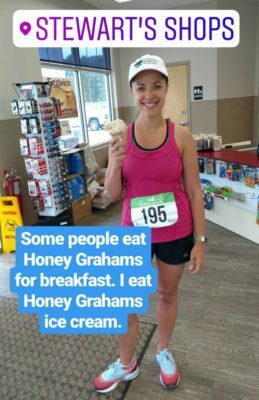 I was totally undecided, until I saw that they had a “honey grahams” flavor: cereal milk-flavored ice cream with a graham cracker swirl and honey flakes! I was sold. I regret nothing… except maybe how dorky I look in this photo.